I was so excited when I heard that Kelly Parra created a stand-alone to her short story series from Prom Dates to Die For and Something Wicked. I have always enjoyed reading about Jaz and Blake's adventures as supernatural hunters. 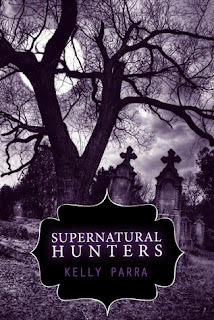 So when buzzTeen emailed me about receiving an ARC for Supernatural Hunters I jumped at it. I found this edition to Jaz and Blake's life the most interesting out of the three, because it really had a lot of tension going on. There was the standard tension of wanting to get to know all of the characters better and find out everything about them, and of course the tension of fighting a supernatural creature, but there was also added tension in this story between Jaz and Blake and their relationship, as well as a new hunter thrown in the story. It was definitely the best of the three stories so far. The tension that takes place between Jaz and Blake is pretty heartbreaking and I will admit that I did tear up, so be prepared. I wasn't expecting it at all, but I think that was the best part. It really did highlight Jaz's character more, though, because it was really a time for her to do some self accessing and soul searching so I think it really added more depth to her character. The only thing I would probably change about this story is to not reveal too much. As the three hunters try and figure out who the Necromancer is Jaz discovers a suspect, but doesn't share it with the group. I think the narrator hinted at Jaz's suspicions too much. I think it should have been only mentioned once, because I think regardless the reader would catch on. That and making the story longer are my only criticisms. Really fantastic story! I really enjoyed all of the tension that Kelly Parra built into the story. There were many different story plots going on and it really made it go from a good short story to a great one. The tension between Jaz and Blake was really heartbreaking and had me in tears. The only criticism I really have for this story is for Kelly to trust her audience more and not give so many hints to who Jaz thinks is the bad guy, and of course to make it longer. Thank you for checking out Book Bite Reviews! Make sure to check the sidebar for more ways to follow! Awesome Inc. theme. Theme images by Radius Images. Powered by Blogger.